Meet the new Windows. Here's a quick video rundown of some of its best features. Windows 8 is here and it has some very cool features. Here are eight of our favorites. The first cool thing about the new Windows 8 operating system is that it's available on multiple devices. That means you can get your laptop, desktop, smartphone, and tablet all unified and working together to simplify your life. And it looks cool doing it thanks to a totally re-imagined user interface. When you start up, the first thing you'll see is the Start screen. On it you'll find titles. These give you quick access to your favorite apps, the people you love-- pretty much your entire digital life. And the Start screen is customizable. You can move tiles around, arrange them in groups, and use them to launch whatever it is you want to do. Clearly, Windows 8 is designed with touch screens in mind, but it works well with a mouse, keyboard, and touchpad too. Here's another cool thing-- the screen edges. Windows 8 tucks different apps and menus here, so they're accessible when you need them and invisible when you don't. This one, called the Charms bar, makes it easy to change settings, share things, or search for things. And speaking of search, when you need to find something just start typing the name and Windows 8 will help you find it. Now, if you're not quite ready to give up old school Windows here's something you'll like. This desktop looks and feels a lot like Windows 7, and you can still access that charms bar and screen edges so it's easy to jump between old school and new school. Tired of typing passwords? With picture password you can sign in with a series of gestures instead. 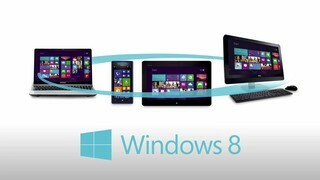 Pretty cool, and so is the way the new OS helps you sync up all your Windows 8 devices. One Microsoft user account connects it all. Your calendar and contacts, apps from the Windows Store, your pictures, and music, which you can store in the cloud with SkyDrive. And the eighth cool thing about Windows 8? You're not alone in figuring it out. Check out Geek Squad's two minute miracle videos for step by step how-tos, or tweet a quick question to @geeksquad, or sign up for tech support and get unlimited help 24/7. And to see more cool things about Windows 8 come on into a Best Buy store.